I have been caring for these wonderful animals for more than 30 years, now. I have learned a lot about how to keep them happy and healthy, even with limited time on your hands. I recommend that all owners have a good understanding of routine care, healthy diet and common medical conditions. These vary from breed to breed and sometimes even between lines within a breed. My recommendations and experience are specific to Shar-Pei from the Baggins bloodline, but most will apply to Shar-Pei in general. The biggest difference will probably be in the medical area, where I have taken great pains to breed out genetic conditions that are more common in the general Shar-Pei population. 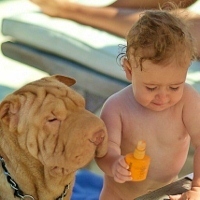 Obedience training is not strictly necessary, but rather a personal choice that may improve your relationship and communication with your Shar-Pei.